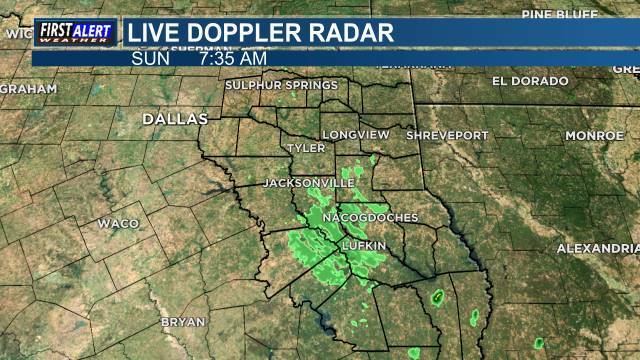 East Texas (KLTV) - Here is the Weather Where You Live... A Much Quieter Weather Pattern is setting up here in East Texas through the upcoming weekend. A weak cold front is expected during the evening hours on Thursday, but that will move through dry and then a slight chance for a few showers on Saturday under partly to mostly cloudy skies, as a very weak disturbance moves overhead...otherwise, not much happening. Cold to Cool mornings and Cool to Mild afternoons are expected. Next chances for rain will be late Monday/early on Tuesday as another front moves in. By the middle part of next week, skies should clear and temperatures should be fairly mild. Enjoy the quieter weather.